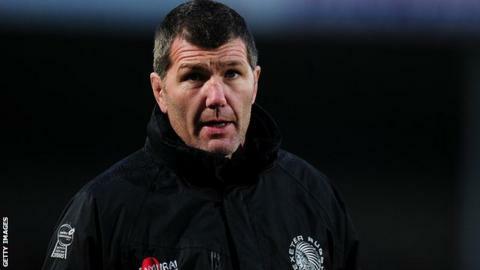 Exeter Chiefs head coach Rob Baxter has said he wants more from his side next season. The Devon club have enjoyed arguably their best campaign ever, finishing fifth in the Premiership, reaching the last four of the European Challenge Cup and getting to the LV= Cup final. "We've got to keep driving ourselves. Although that's a good season, we want more," Baxter told BBC Radio Devon. "Let's not waste any energy looking back at what might've been." Exeter lost just two games at Sandy Park in all competitions and won every match on home soil after their 26-25 defeat by Gloucester in early January. They missed out on the play-offs on points difference but will compete in the European Champions Cup next season. "What happens to you is what moulds you as a team going forward," added Baxter. "To get big crowds and produce the kind of rugby we've been producing this season at home is the foundation for everything you achieve. "You build your club on what happens here at Sandy Park and we're starting to do that."